Who Stole the Global Strategic Maple Syrup Reserve? And How? Did you know there's a Global Strategic Maple Syrup Reserve? There is. Or at least there was. The theft was discovered during a routine inventory check last week at the St-Louis-de-Blandford warehouse, where the syrup [was] being held temporarily. 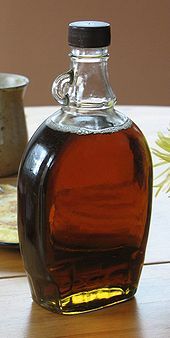 The Federation of Quebec Maple Syrup Producers, which is responsible for the global strategic maple syrup reserve, initially kept the news quiet, hoping it would help police solve the crime quickly. About 10 million pounds of syrup was stored at the site, at a value of more than $30 million [Canadian]. Quebec produces 70-80% of the world's maple syrup, and the FQMSP (or, if you prefer, the Fédération des producteurs acéricoles due Québec) does indeed store lots and lots of syrup in a central location. It says it does this to stabilize supply in times when syrup is scarce (like now, because the American harvest sucked), and so its inventory "can, therefore, be considered a global strategic reserve." Exactly how much they took is still not known, but the reports suggest it was almost all 10 million pounds. (There may be some left in the bottom of the barrels, apparently.) That's 3.75 million liters, enough to fill 7.5 million bottles. The better statistic, though, is that it's enough syrup to fill one-and-a-half Olympic-sized swimming pools. (I was really hoping they stored it that way, but no, it was in barrels.) The motive is fairly obvious—supplies are low, so prices are presumably high, and the thieves are likely hoping to fence the stuff on the black market. To me the puzzling question is how. That's because, as suggested above, these guys did not steal the barrels of syrup. I don't know why, but am guessing the barrels were labeled in some way. But in any event, the Star reported that the thieves siphoned the syrup out of the existing barrels before fleeing. Just how bad was the security if somebody had enough time to siphon 10 million pounds of syrup? While the FQMSP/FPAQ is still trying to figure out exactly how much is missing (they have a merdeload of syrup barrels to weigh), a spokeswoman said not to worry about glazing your flapjacks in the coming months. "We still have enough maple syrup," she insisted. "There will be no shortage." And if somebody stops by your neighborhood wanting to sell you maple syrup out of a tanker truck, please notify the authorities.